Today (29 March) marks the beginning of this year's MM&T and Fashion Access leather trade shows, and just-style has flown out to report on the action. A press trip to Hong Kong tends to serve up equal doses of jet-lag and excitement, and given its proximity is an obvious meeting place for the apparel industry. Rising disposable income throughout China means that in addition to being a global sourcing hub, Hong Kong's fashion retail market is also thriving. It is telling that while local shoppers spend their hard-earned cash on luxury brands, most tourists are more likely to be found at Kowloon's Ladies Market hunting for a bargain these days. APLF director Michael Duck suggests that the 'special administrative region' is also becoming a design capital, one that wants to become the "Paris of Asia". He says that the designer base of China, Japan and India could be better utilised by Western brands sourcing from Asia. 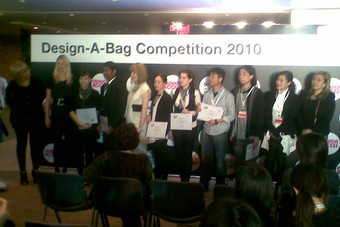 After the launch of the trade shows there was a 'Design-a-bag' competition outside the new Fashion Access area here at the Hong Kong Convention and Exhibition Centre. Participants had really put there thinking caps on for this one, with disappearing bags, scarf bags and nano-laptop bags all catching the eye. However, the prize eventually went to a personal favourite, Chan Wai Sang of The Hong Kong Polytechnic University, who ingeniously designed a backpack that transforms into a space-age looking sleeping bag at the flick of a switch. By Joe Ayling, news editor.